In the Matter of the Endowed Schools Act, l869, and Amending Acts. SCHEME FOR THE ADMINISTRATION OF THE ABOVE-MENTIONED FOUNDATIONS. 1. These Foundations and their endowments set out or referred to in the Schedule hereto shall henceforth be one Foundation, and be administered under this Scheme, under the name of the Bosbury Endowed School, herein-after and in the Schedule hereto called the Foundation. 2. Subject as herein provided the Foundation shall be administered by a Governing Body, herein-after called the Governors, consisting of seven competent persons duly qualified to discharge the duties of the office, five to be called Representative Governors, and two to be called Cooptative Governors. One, until there is such a District Council as herein-after mentioned, by Her Majesty’s Justices of the Peace for the county of Hereford acting in and for the Ledbury Petty Sessional Division, and when there is any body of persons established under any Act of Parliament as a District Council for any district including Bosbury, one by such District Council instead of one by such Justices of the Peace. Each appointment by an electing body shall be made at a meeting thereof convened and held as nearly as may be in accordance with the ordinary rules or practice, if any, of such body, or in case of need or doubt in accordance with rules to be made or approved by the Charity Commissioners for England and Wales. The Representative Governors shall be appointed to office each for the term of five years reckoned from the date of his appointment. No Representative Governor shall be appointed by the said Vicar and Churchwardens until Samuel Bentley hereunder named shall cease to hold office as a Governor, and no Representative Governor shall be appointed by the said Justices of the Peace or the said District Council until Willoughby Baskerville Mynors, hereunder named, shall cease to hold office as a Governor. Subject as aforesaid, the first Representative Governors shall be appointed as soon as conveniently may be after the date of this Scheme. The Chairman or other presiding officer of each meeting at which the appointment of any Representative Governors or Governor shall be made, shall forthwith cause the names or name of the persons or person so appointed to be notified, in the case of a first appointment, to the Governor whose name then stands first on the list of Cooptative Governors, and in other cases to the Chairman of the Governors, or their clerk, if any, or other agent. Any appointment of a Representative Governor by a body entitled to appoint not made as aforesaid within six calendar months from the date of this Scheme, or of the notice herein-after prescribed of a vacancy, as the case may be, shall for that turn be made by the then existing Governors. The Honourable and Venerable Berkeley Lionel Scudamore Stanhope, Archdeacon of Hereford. The Cooptative Governors hereafter to be appointed shall each be appointed by the general body of Governors at a special meeting. The first and other Cooptative Governors shall be appointed to office each for the term of seven years. 5. Any Governor who shall become bankrupt or incapacitated to act, or shall notify in writing to the Governors his wish to resign, or shall for the space of two consecutive years omit to attend any meeting, shall thereupon vacate the office of Governor; and the Governors shall cause an entry to be made in their minute book of every vacancy caused as aforesaid or by the death or the expiration of the term of office of any Governor; and as soon as conveniently may be after any vacancy a new Governor shall be appointed by the body entitled as aforesaid to make such appointment, but so that, except at first as herein-before provided, the number of Cooptative Governors shall never be more than two. Any Governor may be reappointed. Notice of every vacancy of the office of Representative Governor shall be given as soon as conveniently may be by or under the direction of the Governors to the proper electing body, or the clerk, if any, or other agent of such body. 6. Religious opinions, or attendance or non-attendance at any particular form of religious worship, shall not in any way affect the qualification of any person for being a Governor under this Scheme. 7. Every Governor shall, at or before the first meeting which he attends upon his first or any subsequent entry into office, sign a memorandum declaring his acceptance of the office of Governor and his willingness to act in the trusts of this Scheme. And until he has signed such a memorandum he shall not be entitled to act as a Governor. 8. Within one calendar month from the time at which, under the provisions herein contained the administration of the Foundation passes to the Governors a meeting shall be held upon the summons of the Governor whose name then stands first on the list of Coöptative Governors upon some day to be fixed by him. At this meeting the Governors shall elect one of their number to be Chairman of the meeting, and shall make arrangements for the conduct of business. 9. The Governors shall hold their meetings in some convenient place in Bosbury or elsewhere, and shall hold at least two ordinary meetings in each year. Notice in writing of each ordinary meeting shall be delivered or sent by post to each Governor by the clerk, if any, or by some other person acting under the direction of the Governors at least seven days before such meeting. 10. The Chairman or any three Governors may at any time summon a special meeting for any cause that seems to him or them sufficient. All special meetings shall be convened by or under the direction of the person or persons summoning the meeting, by notice in writing delivered or sent by post to each Governor specifying the object of the meeting. And it shall be the duty of the clerk, if any, to give such notice when required by the Chairman or by any two Governors. 11. The Governors shall at their first ordinary meeting in each year elect one of their number to be chairman of their meetings for such year. They shall make regulations for supplying his place in case of his death, resignation, or absence, The Chairman shall always be reeligible. 12. There shall be a quorum when three Governors are present at a meeting, Every question at a meeting shall be determined by the majority of the Governors present and voting on the question, and in case of equality of votes the Chairman shall have a second or casting vote. Any resolution of the Governors may be rescinded or varied at a special meeting held after not less than seven days’ notice. 13. If at the time appointed for a meeting a sufficient number of Governors to form a quorum are not present, or if at any meeting the business is not completed, the Governors present may adjourn the meeting to a day and time, of which, if the meeting is adjourned for more than two days, notice shall forthwith be delivered or sent by post to each Governor. 14. A minute book shall be provided and kept by the Governors, and minutes of the entry into office of every new Governor, and of all proceedings of the Governors, shall be entered in such minute book. 15. The Governors shall make out and render to the Charity Commissioners such accounts as shall be required by such Commissioners, and shall also, on rendering accounts for any year to such Commissioners, exhibit for public inspection in some convenient place in Bosbury an abstract of the accounts so rendered for such year, giving due public notice where and when the same may be seen, and shall at all reasonable times allow the accounts so rendered for any year or years to be inspected, and copies thereof or extracts therefrom to be made, by all persons applying for the purpose. 16. The Governors may from time to time make such arrangements as they may find most fitting for the custody of all deeds and other documents belonging to the Foundation, for deposit of money, for the drawing of cheques, and for the appointment of a clerk or of any necessary agents for their assistance in the conduct of the business of the Foundation at such reasonable salaries or scale of remuneration as shall be approved by the Charity Commissioners, but no Governor acting as such clerk or agent shall be entitled to any salary or remuneration. 17. The freehold and leasehold land and hereditaments belonging to the Foundation are hereby vested in the Official Trustee of Charity Lands and his successors for all the estate and interest of the Foundation therein. All stocks, shares, funds, and securities belonging to the Foundation shall forthwith be transferred, under the authority of an Order of the Charity Commissioners, into the name of the Official Trustees of Charitable Funds. The Governors and all other persons capable of being bound by this Scheme shall, unless the Charity Commissioners otherwise order, do all such acts as may be necessary in order to vest in the Official Trustee of Charity Lands all the freehold and leasehold land and hereditaments, and to transfer to the Official Trustees of Charitable Funds all the stocks, shares, funds, and securities which may hereafter belong to the Foundation. 18. The property of the Foundation not occupied for the purposes thereof shall be let or otherwise managed by the Governors, or by their agents acting under their orders, according to the general law applicable to the management of property by trustees of charitable foundations. All payments for rates, taxes, repairs, and insurance of, or in respect of, any such property occupied for the purposes of the Foundation shall, so far as not otherwise provided for, be made out of the income of the Foundation. 19. Any money arising from the sale of timber or from any mines or minerals on the estates of the Foundation shall be treated as capital, and shall be invested in the name of the Official Trustees of Charitable Funds, under the direction of the Charity Commissioners, except in any special cases in which the Governors may be authorised by such Commissioners to deal otherwise with such money or any part thereof. 20. Until the completion of the full number of Governors, or the expiration of the first three calendar months, or further time, if allowed under this clause, from the date of this Scheme, the present Governing Body, so far as relates to each endowment under this Scheme, shall remain unaltered and shall retain such powers as will enable them to administer the same in the meantime under this Scheme, but on such completion or expiration, whichever first happens, shall become ipso facto discharged from their office, and administration of the Foundation shall pass to the Governors, Such period of three calendar months may be extended, if necessary, by an order of the Charity Commissioners, made upon the application of one or more of the present Governing Body, or of the Governors. 21. After the administration of the Foundation has passed to the Governors as aforesaid the Governors for the time being, if a quorum is formed, may act for all the purposes of this Scheme although the number of Governors as herein-before constituted not full. 22. So far as may be not inconsistent with anything contained. in the Endowed Schools Act, 1860, and Amending Acts, the School may be carried on as heretofore until the end of the school term, if any, current at the date of this Scheme, or until such other time as may, with the approval of the Charity Commissioners, be hired by the body for the time being having the administration of the School under this Scheme. 23. The Governors shall take all proper measures for carrying the provisions of this Scheme into effect as soon as practicable. 24. The School of the Foundation shall be a School for boys, and shall be carried on in or near the parish of Bosbury, in the present buildings or in other suitable buildings hereafter to be provided by the Governors. It shall be conducted as a Public Elementary School under section 7 of the Elementary Education Act, 1870. 25. the Governors shall appoint and pay, and may at their pleasure dismiss, all Teachers at the School, and subject to any regulations of the Education Department in force for the time being, shall have power to regulate and prescribe from time to time their respective qualifications. 26. All scholars in the School shall pay such tuition fees suitable in an Elementary School as the Governors shall fix from time to time. 27. Subject to the provisions of this Scheme, religious instruction in accordance with the principles of the Christian Faith shall be given in the School under such regulations as shall be made from time to time by the Governors. No alteration in any such regulations shall take effect until the expiration of not less than one year after notice of the making of the alteration shall have been given by the Governors in such matter as they shall think best calculated to bring the matter within the knowledge of persons interested in the School. Instruction in the subjects required by the regulations of the Education Department shall also, subject to the control of the Governors, be given in the School according to the classification and arrangements made by the Principal Teacher. 28. The Governors shall not be precluded by any provision in this Scheme from conforming to any regulations within the Education Department under the Elementary Education Act, 1870, or under any authority may impose as the conditions of a grant of money, provided that such regulations shall not be inconsistent with the provisions of the Endowed Schools Act, 1869, and Amending Acts. 29. A yearly sum of £3 shall be applied in prizes or rewards, of the value of not more than £1 in any one case, for boys who are resident in the parish of Bosbury and have for not less than two years been scholars at the School. 30. An Exhibition, to be called King Edward’s Exhibition, of the yearly value of £18 tenable for there years at the Hereford County College, or at any other place of education higher than Elementary approved by the Governor, shall be maintained. It shall be open only to boys whose parents have for not less than three years been resident in the parish of Bosbury. In the award of this Exhibition preference shall always be given to boys who are and have for not less than three years been scholars in the School. 31. The Exhibition shall, subject as herein provided, be awarded and held under such regulations and conditions as the Governors think fit, and shall be given as a reward of merit, on the result of such examination as the Governor think fit, and shall, except as herein provided, be freely and openly competed for, and shall be tenable only for the purposes of education. If at any time there shall be no candidate who on examination shall be adjudges worthy to take the Exhibition, it shall be for that turn not awarded. 32. If any holder of the Exhibition shall, in the judgement of the Governors, be guilty of serious misconduct or idleness, or fail to maintain a reasonable standard of proficiency , or wilfully cease to pursue his education, the Governors may deprive him of the Exhibition, and for this purpose, may act on the report of the proper authorities of the college, or place of education at which the Exhibition is held, or on such evidence as the Governors think sufficient. Under this clause the decision of the Governors shall be final in each case. 33. The parent or guardian of, or persons liable to maintain or having actual custody of, any scholar attending the School as a day scholar, may claim, by notice in writing addressed to the principal teacher, the exemption of such scholar from attending prayer or religious worship, or from any lesson or series of lessons on a religious subject, and such scholar shall be exempted accordingly, and a scholar shall not, by reason of any exemption from attending prayer or religious worship, or any lesson or series of lessons on a religious subject, be deprived of any advantage or emolument in the School or out of the endowment of the Foundation to which he would otherwise have been entitled. If any teacher, in the course of other lessons at which any such scholar is in accordance with the ordinary rules of the School present, shall teach systematically and persistently any particular religious doctrine from the teaching of which any exemption has been claimed, as in this clause before provided, the Governors shall, on complaint made in writing to them by the parent, guardian, or person liable to maintain or having the actual , custody of such scholar, hear the complainant, and inquire into the circumstances, and if the complaint is judged to be reasonable, make all proper provisions for remedying the matter complained of. 34. Any balance of income of the Foundation remaining in hand at the end of any year, and not needed as a balance for meeting current expenses shall be treated as capital, and be invested in the name of the Official Trustees of Charitable Funds in trust for the Foundation in augmentation of its endowment. 35. The Governors may receive any additional donations or endowments for the general purpose of the Foundation. They may also receive donations or endowments for any special objects connected with the Foundation which shall not be inconsistent with or calculated to impede the due workings of the provisions of this Scheme. Any question arising upon this last point shall be referred to the Charity Commissioners for decision. 36. Within the limits prescribed by this Scheme the Governors shall have full power from time to time to make regulations for the conduct of their business and for the management of the Foundation, and such regulations shall be binding on all persons affected thereby. 37. Any question as to the regularity or validity of any proceeding under this Scheme , or as to the construction or application any of the provisions of the Scheme, shall be referred by the Governors to the Charity Commissioners for their decision, and such decisions shall be binding on the Governors and on all persons claiming under the Foundation who shall be affected by the question so decided. 38. So far as relates to the Foundation, all jurisdiction of the Ordinary relating to or arising from the licensing of masters in any endowed school is hereby abolished. 39. No person shall be disqualified from being a Master in the School by reason of his not being, or not intending to be, in Holy Orders. 40. 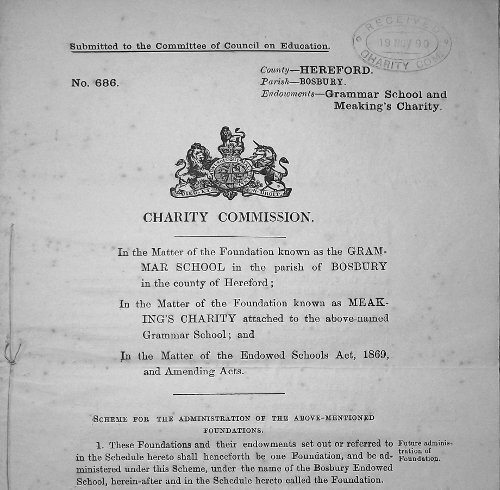 The Charity Commissioners may from time to time, in the exercise of their ordinary jurisdiction, frame Schemes for the alteration of any portion of this Scheme, provided that such Schemes be not inconsistent with anything contained in the Endowed Schools Act, 1869, and Amending Acts. 41. Nothing in this Scheme shall affect any order of the Charity Commissioners now in force, so far as it makes provision for the discharge of any mortgage debt on any property of the Foundation, or for the replacement of any stock or money advanced out of the funds of the Foundation. From and after the date of this Scheme the Foundation shall for every purpose, except as in this Scheme provided. be administered and governed wholly and exclusively in accordance with the provisions of this Scheme, notwithstanding any former or other Scheme, Act of parliament, Charter or Letters Patent, statute , or instrument relating to the subject matter of this Scheme. 42. The Governors shall cause this Scheme to be printed, and a copy to be given to every Governor and Principal Teacher upon his entry into office, and copies may be sold at a reasonable price to all persons applying for the same. 43. The date of the Scheme shall be on the day on which Her Majesty by Order in Council declares Her approbation of it. 1. The messuage used for the purposes of the School of the Foundation situate at or near the north-east corner of the churchyard of the parish of Bosbury, and numbered 310 on the Tithe Map of the same parish. 3. A sum of £25 2s. 3d. Two and three-quarters per cent. Consolidated Stock standing in the name of the Official Trustees of Charitable Funds. 4. A sum of £107 5s. 7d. Two and three-quarters per cent. Consolidated Stock standing in the name of the Official Trustees of Charitable Funds. 5. All other, if any, property belonging to either Foundation. The subject of each clause is given in the marginal heading on the original document. I have ignored these headings to save space but highlighted the subject in certain cases.